The development of information and communication technology in the 21st century developed so fast. Therefore, various life skills are needed to be able to keep pace with the rapid development of technology. One of them is creative thinking skills. The skill of creative thinking can be cultivated through local potential physics-based learning. This study aims to determine whether there is an increase in creative thinking skills of students who conduct local potential based learning. The research method used was quasi experiment. The instruments used were tests and observation sheets. Data analysis used quantitative and qualitative descriptive analysis. The results showed that there is an increase in creative thinking skills of students who conducted physics learning based on local potential of 0.15975 in the low category. Agung, S. L (2015). The Development of Local Wisdom-Based Social Science Learning Model with Bengawan Solo as the Learning Source. American International Journal of Social Science. 4(4), 51-58. Asmani, J. M. (2012). Pendidikan Berbasis Keunggulan Lokal. Yogyakarta: DIVA Press. Ardan, A. S., Ardi, M., & Hala, Y. (2015). Needs Assessment to Development of Timor. International Education Studies;8(4). https://doi.org/10.5539/ies.v8n4p52. BPS (Badan Pusat Statistik). 2018. Keadaan Ketenagakerjaan Indonesia Februari 2018. No. 42/05/Th. XXI, 07 Mei 2018. Pornpimon, C., Wallapha, A., & Prayuth, C. (2014). Strategy challenges the local wisdom applications sustainability in schools. Procedia-Social and Behavioral Sciences, 112, 626-634. https://doi.org/10.1016/j.sbspro.2014.01.1210. Collette, A. T. & Chiappette, E. L. (1994). Science Instruction in The Middle and Secondary Schools. New York: Macmillan Publishing Company. Bakır, S., & Öztekin, E. (2014). Creative thinking levels of preservice science teachers in terms of different variables. Journal of Baltic Science Education, 13(2), 231-242. Erdogan, T., Akkaya, R., & Celebi Akkaya, S. (2009). The Effect of the Van Hiele Model Based Instruction on the Creative Thinking Levels of 6th Grade Primary School Students. Educational sciences: theory and practice, 9(1), 181-194. Fauziah, Y. N. (2011). Analisis Kemampuan Guru dalam Mengembangkan Keterampilan Berpikir Kreatif Siswa Sekolah Dasar Kelas V pada Pembelajaran Ilmu Pengetahuan Alam. 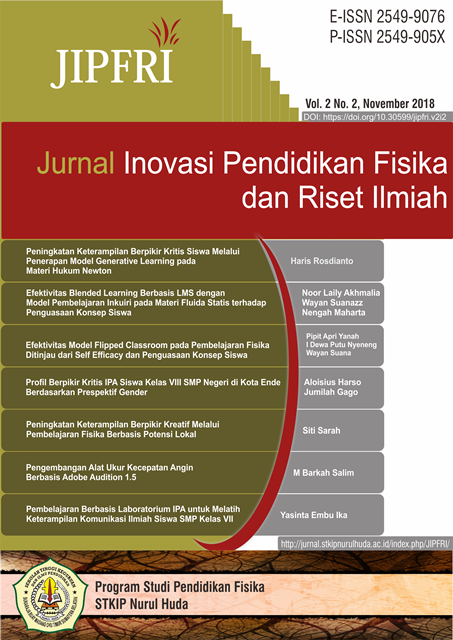 Jurnal Edisi Khusus, 1(1), 98-106. Giancoli, D. C. (2011). Fisika: Prinsip dan Aplikasi Edisi Ketujuh 1 Jilid 1. (Terjemahan Irzam Hardiansyah). Erlangga: Jakarta. Hariyadi, P. (2010). Penguatan Industri Penghasil Nilai Tambah Berbasis Potensi Lokal peranan Teknologi Pangan untuk Kemandirian Pangan. Jurnal PANGAN,19(4). Hariyadi, P. (2010). Penguatan Industri Penghasil Nilai Tambah Berbasis Potensi Lokal peranan Teknologi Pangan untuk Kemandirian Pangan. PANGAN, 19(4), 295-301. Hencer, A. H. (2013). The Correlation Between the Scientific Process and Creative Thinking Skills of the Preservice Teachers. International Journal Of Academic Research, 5(3), 240-246. Kandemir, M. A., & Gür, H. (2009). The use of creative problem solving scenarios in mathematics education: views of some prospective teachers. Procedia-Social and Behavioral Sciences, 1(1), 1628-1635. https://doi.org/10.1016/j.sbspro.2009.01.286. Kesiman, M. W. A. & Ketut, A. (2012). The Implementation of Hypertext-based Learning Media for a Local Cultural Based Learning. Journal of Information Technology Education: Innovations in Practice, 11, 377-385. http://www.jite.org/documents/Vol11/JITEv11IIPp377-365Kesiman1115.pdf. Lai, E. R. & Viering, M. (2012). Assessing 21st Century Skill: Integrating Research Findings. National Council on Measurement in Education. Person. 1-66. Mardapi, D. (2008). Teknik Penyusunan Instrumen Tes dan Nontes. Yogyakarta: Mitra Cendekia Press. Meintjes, H. & Grosser, M. (2010). Creative Thinking in Prospective Teachers: the Status Quo and The Impact of Contextual Factors. South African Journal of Education, 30(3), 361-386. http://dx.doi.org/10.15700/saje.v30n3a360. Mungmachon, R. (2012). Knowledge and Local Wisdom: Community Treasure. International Journal of Humanities and Social Science, 2(13), 174-181. Piawa, C. Y. (2010). Building a test to assess creative and critical thinking simultaneously. Procedia-Social and Behavioral Sciences, 2(2), 551-559. https://doi.org/10.1016/j.sbspro.2010.03.062. Robson, S. (2014). The Analysing Children's Creative Thinking framework: development of an observation‐led approach to identifying and analysing young children's creative thinking. British Educational Research Journal, 40(1), 121-134. https://doi.org/10.1002/berj.3033. Learning: The Finnish Approach. Journal of Education Policy, 22(2), 147–171. https://doi.org/10.1080/02680930601158919. Sarah, S. & Maryono (2014). Pengembangan Perangkat pembelajaran Berbasis Potensi Lokal untuk Meningkatkan Living Values Peserta Didik SMA di Kabupaten Wonosobo. Technoscientia, 6(2), 185-194. Sarah, S. & Maryono. (2014). Keefektivan Pembelajaran Berbasis Potensi Lokal dalam Pembelajaran Fisika SMA dalam Meningkatkan Living Values. Jurnal Pendidikan Sains, 2(1), 36-42. Scheider, W. (1980). 27 commandments for physics teachers. The Physics Teacher, 18(1), 32-33. https://doi.org/10.1119/1.2340404. Suastra, I. W. (2005). Reconstruct the original Science (Indigenous Science) in order to develop local cultural-based science education in schools: Etnosains Study on Community Penglipuran Bali (Unpublished dissertation). Bandung: Graduate Education University of Indonesia. Suastra, I. W. dan Nengah. (2010). Science-based models of local culture to develop Basic Competence in science and value of local wisdom in junior high School. Journal of education and the teaching of State Univ. Singaraja, 43(2), 8-16. Tawil, M., & Liliasari. (2013). Berpikir Kompleks dan Implementasinnya dalam Pembelajaran IPA. Makasar: Badan Penerbit UNM. Trilling, B., & Fadel, C. (2009). 21st Century Skills, Learning for Life in Our Times. San Francisco, CA: John Willey & Sons. Udi. E. A., & Amit, M. (2011). Developing the Skills of Critical and Creative Thinking by Probability Teaching. Procedia Social and Behavioral Science, 15, 1087-1091. Vari, S. G. (2015). Key elements of networking in life sciences: collective creative thinking and team work. Croatian medical journal, 56(2), 75-77. https://dx.doi.org/10.3325%2Fcmj.2015.56.75. Wright, S. (2010). Understanding Creativity in Early Childhood Meaning-Making and Children’s Drawings. London ECIY 1 SP: Sage Publications Ltd.